Bonny Schumaker, pilot & Director of ‘On Wings of Care‘ took to the skies again today heading for Bay Jimmy in Barataria Bay. Accompanied by marsh ecologist, Bri Bernik, and filmmaker, Bess Carrick, they flew South from Lakefront Airport in New Orleans to investigate the reports of oil washing ashore in Barataria Bay. They fly over the area of Bay Jimmy where reports of a destructive marsh clean up operation are under way with cranes tearing away the marsh grass. 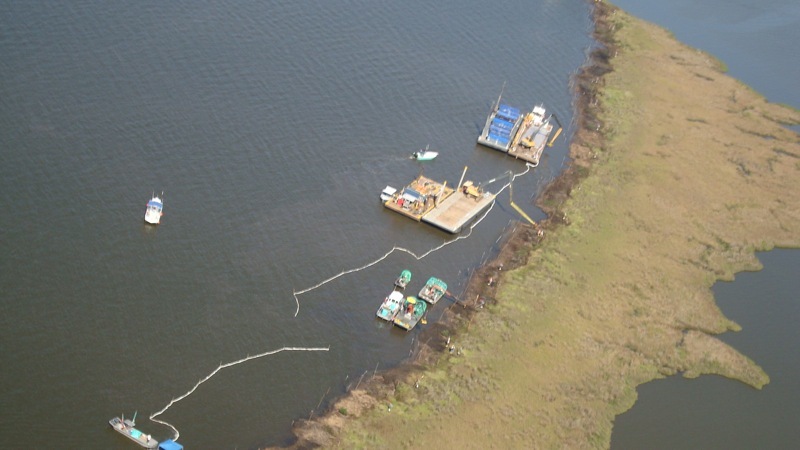 The team found boats just offshore using huge shovels on long-armed cranes, digging into the marsh shoreline and pulling out large quantities of oiled marsh grass, then placing these into large receptacles that were collected onto much larger ‘trash depot’ boats nearby. This aggressive digging is being done on a crescent shaped part of Bay Jimmy which is very fragile ecologically. It is feared that this digging “remediation” will cause this piece of the island to soon disappear adding it to the column of wetlands lost. Bonny had wanted to confer with ecologists familiar with issues of marsh restoration, and our friend and videographer for the flight, Bess Carrick, referred us to an outstanding scientist: Ms. Brittany Bernik, a Ph.D candidate in molecular ecology at Tulane University who specializes in the study of marsh restoration. Brittany joined us for this flight, and a combination video-interview made by Bess during the flight is provided below. 2. The approach we were witnessing is mechanical, or manual cleanup: they rake and break up the oiled marsh material and then try to remove all of it. Of course, in that process they remove a considerable amount of marsh substrate. In the high-erosion environment of Louisiana’s marshes where wetlands are being lost at an alarming rate, unnecessary removal of vegetation and substrate is downright sacrilegious. 3. In addition to removing precious marshland, this kind of manual cleanup is also counterproductive to helping the marsh recover from the oil spill. Here is what we understood from Brittany (paraphrased): In these marshes, the plants are all connected with one another through their root systems; the plants are actually large colonies of effectively one organism that takes up a lot of marsh meadow. So the energy of that entire system of plants is used to help regenerate the stressed areas along the fringes. This is how some plants can continue to grow even in very contaminated soils, because they are being supported by the rest of the colony. To remove the plants on the contaminated shoreline does worse than remove just those plants; it actually causes a loss and greater stress to the entire plant (colony), which will now have to devote much of it energies toward regenerating its fringes. 4. The ‘cleanup’ going on along the sandy beaches and shoreline farther south suffers similar problems, except that sand is more easily replaced than is shoreline marsh material. 5. Finally, aside from these cleanup approaches being deadly to the marsh itself, they are doomed from the start. For every time we have a new storm, new oil will be pushed up from the ocean bottom. The answer is not to continue to try to remove or otherwise hide from view the oil that will continue to wash on to our shores. The answer is to focus on helping the recovery of the wetlands.